Amul's response to a nationwide bandh last week. Image from Amul's website. Growing up in Mumbai, the one thing I looked forward to on the morning bus trip was the unmissable Amul hoarding at Mahim Causeway. Every week, once a week for all my school going years, that one hoarding would bring a smile to the day. Sometimes it would be a giggle at a piece of gossip and usually a laugh at one of their utterly butterly delicious jokes, but more often than not, the Amul Butter ad campaign would bring a different perspective to the week’s news, offering respite from the seriousness with which adults treated the world. The infamous, cheeky Amul ads were a part of how I came to understand current affairs. On the rare chance that I got a ride to school with my father, they became the point at which I’d ask him questions about the things I didn’t understand. Things like the Harshad Mehta scam and elections and cricket. Amul’s story runs concurrent to the story of modern India, all the more so because of the topical nature of their advertising. Their billboards have been an intrinsic part of the urban visual landscape in India for well over 50 years now. Once promoted solely through outdoor hoardings in cities like Mumbai and Delhi, they form the longest running campaign in the history of advertising anywhere in the world. Today they appear in daily newspapers, on social networking sites and on the Amul website in a variety of languages. In the same week (usually Wednesdays), different region-specific ads may be released in different cities, sometimes in different languages, but always reflecting local concerns. The book Amul’s India just published by Harper Collins and soon to be formally launched, tells the story of India through these iconic advertisements that have captured the nation’s zeitgeist from 1966 when they first began. Whether it was last week’s national bandh, Sachin Tendulkar’s 100th century, a political scandal or international event, if it mattered in urban India, you can be sure there was an Amul ad for it. The moppet commemorates the Indian rupee symbol in 2010. 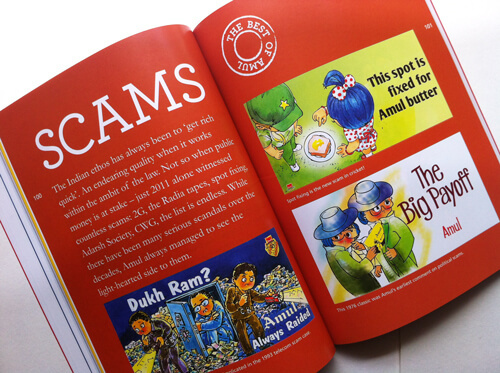 Image from the Amul website. A 1977 take on the compulsory sterilization plan undertaken during the Emergency under Indira Gandhi's government. Image from Amul's website. Cartoons have recently caused a kerfuffle with the political establishment. An Amul response from April this year. Image from Amul's website. Amul’s story begins in 1946 when the Gujarat Co-operative Milk Marketing Federation Ltd. was founded as a co-operative effort to bring economic freedom to Gujarat’s farmers. The movement was spear-headed by the determined Dr. Verghese Kurien who is widely acknowledged to be the father of the ‘White Revolution’ in India and it has been through his efforts in Operation Flood — the world’s largest dairy development programme — that India is self-sufficient for its milk supply. Today his movement involves millions of farmers and provides a sterling example to other co-operative initiatives around the world. The GCMMF’s dairy revolution is one of the great success stories of modern India and so is perhaps, daCunha Communications’ ad campaign for their hero brand, Amul. When the GCMMF decided to advertise their butter, Sylvester daCunha’s company created the adorable moppet we all call the “Amul girl”. Where other personalities such as Air India’s Maharaja and Onida’s devil have fallen by the wayside, the sprightly, cheeky girl has come to represent a brand that is both classic and contemporary, ever changing and always in tune with the times. Amul’s India charts a course for one of India’s most recognisable brands, but it also provides an alternative history of India from the vantage point of a spectator. To begin with the hoardings catered to a select audience of English-speaking Indians; fast-forward to today and they reference pop phenomena like Bollywood and cricket. The themes have changed, the concerns of Amul’s audience have changed and the brand speaks as much to the common man as R.K. Laxman’s cartoons. Through it all, the Amul Butter billboard has provided commentary, satire, criticism and opinion through a few choice words and an endearing illustration. It is an exercise in simplicity that has allowed the campaign to remain virtually unchanged since it first began. Amul’s India is a collection of essays by well known personalities like Shobhaa Dé, Rajdeep Sardesai, Amitabh Bachchan and Shyam Benegal. Each person tells of their own associations with the brand and the significance it holds from them. Importantly, for the first time, we gain insight into the creative process and people behind each ad, as well as the effort it takes to keep the campaign going on a weekly basis. At a time when the establishment in India is becoming increasingly intolerant of free speech and political cartoons, it is well worth remembering the legacy of Amul’s ad campaign. Were it not for the daCunhas and their agency’s capacity to stand by each provocative ad that they have created over the last five decades, we would not have had such a valuable perspective on Indian history, nor such a simple, accessible record of its contribution in the form of Amul’s India. “If it ain’t broke, don’t fix it. Leave the campaign as it is,” recommends the Big B and I for one, couldn’t agree more. I hope we never lose the refreshing Amul girl and her sharp take on modern Indian life. Very interesting piece, thank you! Look forward to getting hold of a copy of the book.